We are pleased to present exciting new and recent work by 7 international photographic artists, including 3 world premieres at South Main Gallery. The exhibition features Goga Bayat, David Ellingsen, Jim Friesen, Diana Nicholette Jeon, Edward Peck, Phyllis Schwartz and Andrew Ward. Don’t miss a chance to talk to the artists about their work on Thursday at the Opening Reception or Saturday at the Artist Talk featuring Diana Nicolette Jeon and Andrew Ward. Seven global photographers converge in an exhibition about the rhythms and tensions in the contemporary geographical, social and psychological landscapes. Intervals: Photography in Flux is a collection of unique and unusual digital and photographic processes that are rarely seen in one setting. 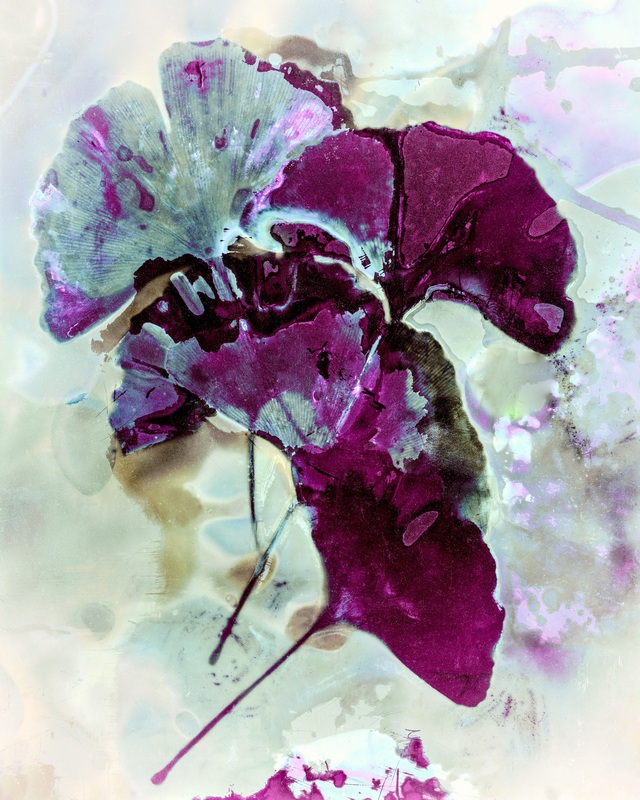 The methods and techniques range from those used long before the invention of the camera to the advanced technology available to artists today. 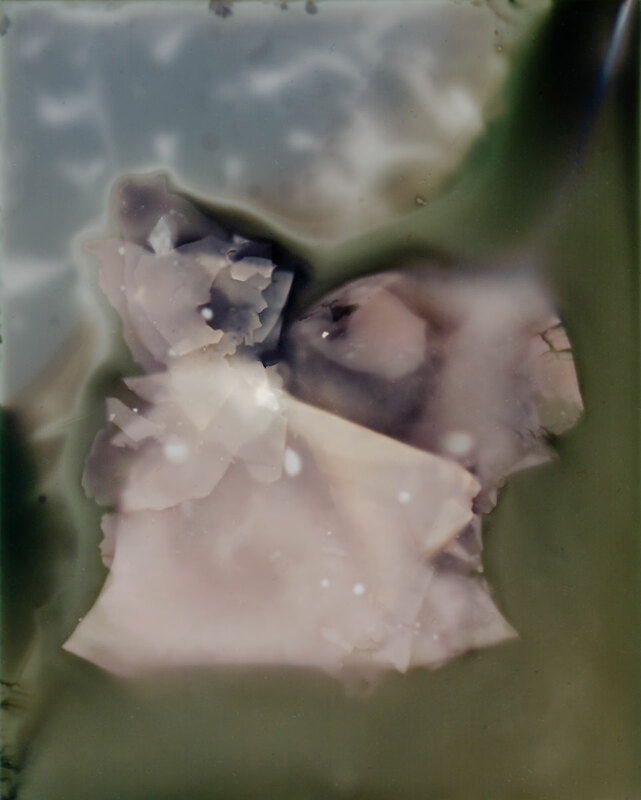 The works are presented through diverse photographic methods using encaustic, cameraless exposures, and iPhonography. Their themes thread around the deconstruction of identity, environmental issues, disposable society, speaking under oppression and the mysteries in the mundane. The exhibition continues through Saturday, 09 April. South Main Gallery is open Tuesday – Thursday (10AM – 5:30 PM), Friday-Saturday (11AM-5:30PM) and Sunday by appointment; private viewing available (604.565.5622). An Artist Talk will be held on Saturday, 08 April (2-4 pm). I am writing this blog so I can learn to spell and understand pareidolia. In the 70s, I read an article in Scientific American that explained how the eye-brain constructed recognizable shapes from ambiguity. That information gave me insight into how visual art that compelled caused me to look again, and I was sure I would remember that word. I reached for that word many times, talking around it and hoped someone could fill in the gap in my knowledge. That gap was filled in conversation following one of my Facebook posts during the Black and White Photo challenge this September. Now in a time when access to this kind of information is only a few keystrokes away, I am able to fill in that gap. Pareiolia explains why we see the man in the moon, dragons in clouds, faces (especially eyes) in tree bark and projected imagery in reflective surfaces. This rediscovery of this word and this phenomenon gives both an explanation for my fascination with abstract Lumen Print compositions and a context for my artist process. Artwork, music and literature that offer multiple valid readings have always attracted me; my favourites continue to invite another layer of meaning. My Lumen Prints that render smaller ambiguous pareidoltric artifacts engage my viewers and often spark interesting conversation. I look again. One of my most enduring compositions, Mother and Child, was an early starting point in my Lumen Print artist practice. When I look at this Lumen Print, I see a goat like figure and a playful calf nuzzling up affectionately to a protective figure, a mother to my way of looking at it; I want to see a Mother and Child, and a reach into the photograph for more imagery to complete that story. Others might see darkened outlines of familiar seaweed shapes: bladderwrack, sea lettuce and the potassium deposits made by sheets of Lamenaria left out in the rain. My early Lumen Print work was essentially creative botanical documentation. I discovered the X-Ray like marks in Lumen Prints yield more information than in botanical drawings; these Lumen Print documents simultaneously photograph the interior and exterior of the specimen. When I freed these materials from their orthodox portraiture and used these materials in the markmaking process, then landscapes and narratives emerged. Instead of Lamenaria and Bladderwrack resting on photosensitive surfaces for a portrait, they were telling stories. 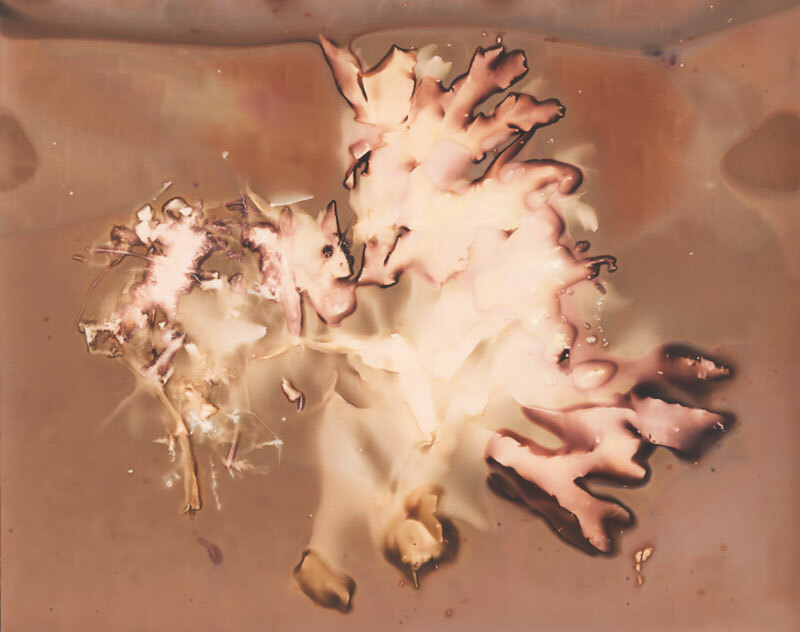 Wanting to go beyond the discoveries of the botanists who were among the first to discover a photographic process for recording visual information in their notations, I turned to an exploration of the capacity of sheet film in Lumen Printing. A 4 x 5 inch block of sheet film does not leave much space for composition, a challenge when I was composing organic material on photo paper that measured 16 x 20 inches. I was curious to find out how much detail sheet film would record for printing and projecting in large format. Sea Shells and Rainwater was my first handmade negative; I positioned a small handful of crushed seashells on sheet film and exposed it to an afternoon of hazy light. This negative was digitized and developed much the way I worked in an analogue darkroom: amplifying light and tonal values. I worked on this image until it came to life: when a pair of eyes appear and a life form took shape on a green colour field. In digital format, I am able to show X-Ray layers in much the same way they appear in analogue Lumen Prints. Recent Lumen Prints, both analogue and digital, tell pareidolic stories: Caribou posing for a portrait, momento mori in What Remains from gathering foliage in New York, possible life forms Among Cherry Blossoms, a portrait emerging from Chesterman Beach sea tangles. And more at Sassamatt Images. Art Rental Show — two of my recent Lumen Prints have been added to the Cityscapes Art Rental collection and will be on show in their salon syle exhibition. Thursday, 08 January, 7 – 9 PM (Cityscapes, 355 Lonsdale, North Vancouver). Truth and Beauty DoorCrasher Special— offers Limited Edition Prints (Desert Salt, for example), OpenStock Prints and Loose Prints at discounted prices. One week only: 10 – 17 January (Noon – 5pm), 698 West 16th Avenue. Check out the Collective collection. Winter Salon at Photohaus Gallery — WinterSalon continues thru January. Three of my Lumen Prints are on show in this exhibition. Two of these prints are analogue lumen prints; it is an exciting opportunity because (as far as I know) I am the only artist in Greater Vancouver working in this hybrid photo-printmaking medium. Check website for hours of opening and location. It’s art residency season. Working in classrooms adds another layer to my artist practice: ideas spark when I share my ideas, techniques and suggestions. Curious minds ask provocative questions. Busy hands show me how my own practice transforms in a shared creative process. Ideas go places I never would have imagined. Exhibition and celebration brings new ideas to move forward.There’s always much to show for these joyful moments in the classroom, and I long for studio time so I can go forward with new ideas and new work. Recently, I presented a lumen prints workshop at the ArtStarts Gallery in celebration of BC Arts and Culture Week in conjunction with Botanimalogy—Expressions of Nature, an exhibition of lumen prints made during my residency at Kitsilano Secondary School. This exhibition of both analogue and digital lumen prints is on show through August at the ArtStarts Gallery at 808 Richards Street, open Tuesday through Saturday.